Toronto, ON – The Ontario Hockey League today announced the All-Star teams for the 2012-13 OHL regular season. The Plymouth Whalers and the London Knights are represented twice on the First Team with Red Tilson Trophy winner and OHL Top Scorer Vince Trocheck, and OHL Coach of the Year Mike Vellucci for the Whalers. The Knights have Top Scoring Right Winger Seth Griffith and two-time Defenceman of the Year finalist Scott Harrington. 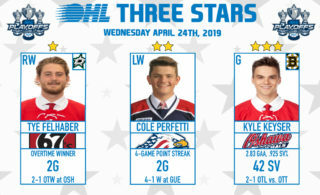 The Owen Sound Attack lead the way with a total of three players represented across the three teams including First Team All-Star and Goaltender of the Year Jordan Binnington, Second Team All-Star Cody Ceci on defence, and Third Team All-Star Cameron Brace at right wing. 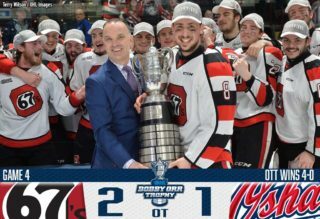 Five other teams have multiple representatives including the Sarnia Sting (Reid Boucher and Charles Sarault), Sault Ste. 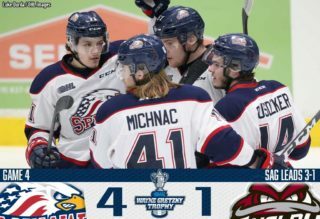 Marie Greyhounds (Ryan Sproul and Colin Miller), Kitchener Rangers (Ryan Murphy and John Gibson), Belleville Bulls (Malcolm Subban and George Burnett), and the Oshawa Generals (Boone Jenner and D.J Smith). Scott Harrington appears on the First All-Star Team for the second straight year while fellow First Team All-Star defender Ryan Sproul was on the Third Team last season. First Team All-Star Seth Griffith was on the Second All-Star Team last season. 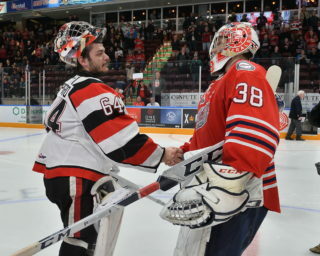 Cody Ceci is a Second Team All-Star for the second straight season, while Second Team All-Star goaltender John Gibson was a Third Team All-Star last season. Ryan Murphy is listed as an All-Star for the third straight season after appearing as a Second Team All-Star last season and a First Team All-Star in 2010-11.